this weekend i had the immense pleasure of meeting *in person* with melinda and her sweet sweet henry. we met in la crosse, wi since it was almost half-way between mankato and beloit. but let me tell you, the drive seemed almost nothing, riding as high as i was on excitement and anticipation! melinda was one of the first people i met on ravelry, and we had an instant connection. it was only mildly surprising then, when after meeting her for the first time in person i didn't feel like i was meeting someone new but having a reunion with a dear old friend. it was a wonderful meetup, full of knitting, baby snuggling, discovering yummy food (except for that nasty grease-fest chinese takeout! ), more knitting, tea sipping, and lots and lots of chatting. how could we not stay here? 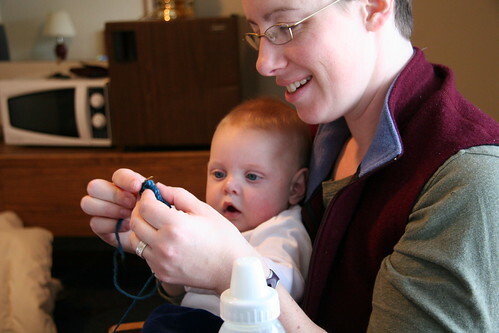 a sweet mama-baby knitting moment. the cutest, sweetest, fat-cheeked, hat-slobbering baby ever! 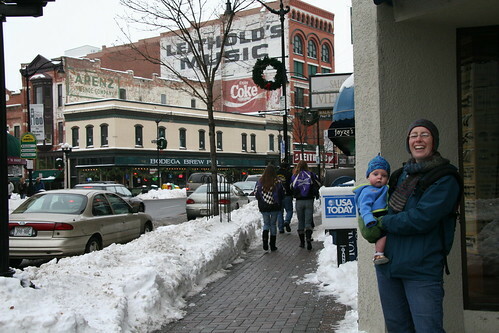 out and about, exploring beautiful downtown la crosse. thank you so much melinda for the perfect mel-mel meetup weekend! i hope that we can do it again soon! How wonderfully fun! Sounds like an excellent weekend. I can't believe all that snow. Did you nibble Henry's feet for me? 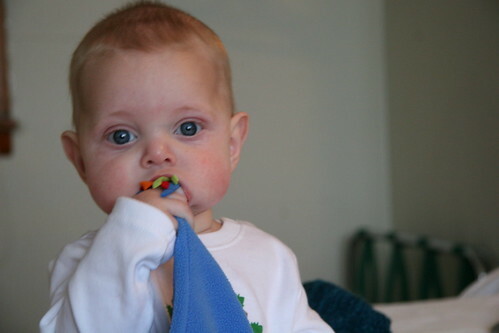 He is just the cutest!! Great eyes he has.. Very cute indeed..
You are a fast poster! It'll take me a few days just to catch up on the laundry and mess in the house :) Especially since Henry figured out today that he can motor the walker over to the tree and yank on it. We had a fabulous time meeting you (or chewing on you if you ask Henry), knitting and sipping tea, and checking out La Crosse. Next time we should do a photo shoot of all of the beautiful neon signs in the city. Sounds like a great time was had ! Look at that snow....I'm jelous..
hooray for such a wonderful wonderful time! i have been anxiously awaiting hearing about your trip all weekend! how lucky you are to meet the lovely melinda and her adorable henry in person! Looks like you had a good weekend! It's fun meeting up with knitting friends. Sounds like such a fun weekend meeting up with a new old friend. 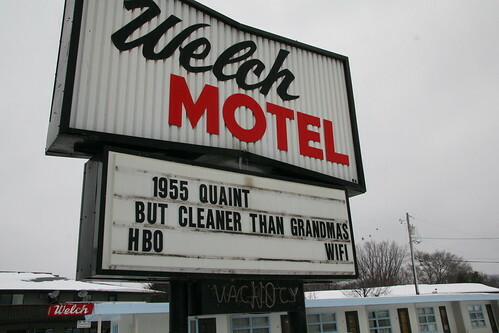 That motel sign cracks me up!